The CZD feels like a loose fitting wetsuit and enables the diver to have unmatched dexterity and unrestricted flexibility. The CZD comes standard with an integrated instrument sleeve on the forearm enabling the diver to securely place a compass, dive computer, watch or wrist slate for information at a quick glance. Always be clear, confident, and in control of where you are going and how you are diving. The inner seams are heat pressure taped and guaranteed for the life of the suit not to leak. Additionally, the TiZip™Master Seal is durable, requires little maintenance, and allows the diver ease of donning/ doffing. The neck and wrist seals are a unique 3mm neoprene Air Compression Seals that are not only warm but also tough which means they will not ‘tear and run’ as latex seals often do. The CZD utilizies SiTech adjustable exhaust valve. Placing valve on the bicep makes dumping air fast, increasing the ability to achieve neutral buoyancy quickly. If one’s personal preference prefers exhaust valve be placed elsewhere, we happily offer that option. Our knee pads are extra-large and super tough. They are of a soft and flexible rubber that stretches with the suit and gives the knees longer wear. The tapered leg design reduces air flow to the feet making each dive safer. The attached boots are warm and smart because they are shaped like a heavy duty wetsuit boot which means our divers do not need to size up their fins for our suits. 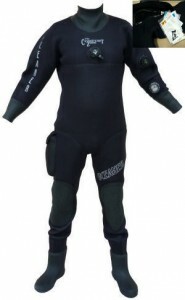 Other drysuit boots are extra big that a lot of divers do not realize until it is too late and are then required to buy new fins. If your shoe size does not match our stock boot size, no problem, we will make the suit with your size @ no extra charge. Custom sizes are available and you can also have your name screened on the suit for extra personalization.